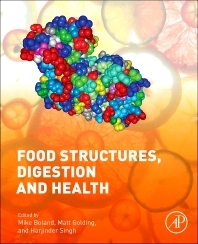 This selection of key presentations from the Food Structures, Digestion and Health conference is devoted to the unique and challenging interface between food science and nutrition, and brings together scientists across several disciplines to address cutting-edge research issues. Topics include modeling of the gastrointestinal tract, effect of structures on digestion, and design for healthy foods. New knowledge in this area is vital to enable the international food industry to design of a new generation of foods with enhanced health and sensory attributes. The multidisciplinary approach includes research findings by internationally renowned scientists, and presents new research findings important and pertinent to professionals in both the food science and nutrition fields. Mike Boland joined the Riddet Institute in 2006 after 15 years in the dairy industry, first with the New Zealand Dairy Research Institute and then with Fonterra. During this time he headed a group involved in protein research and was General Manager for strategic research. He was also Global Program Leader for the New Zealand Dairy Board's Milk Characteristics program. Extensive liaison with high profile overseas researchers in the UK, USA and Germany enabled Dr Boland to bring the very best of those collaborations to his New Zealand work resulting in excellence in commercial processes and innovation for New Zealand. Dr Boland has published about 80 papers and 6 patents.